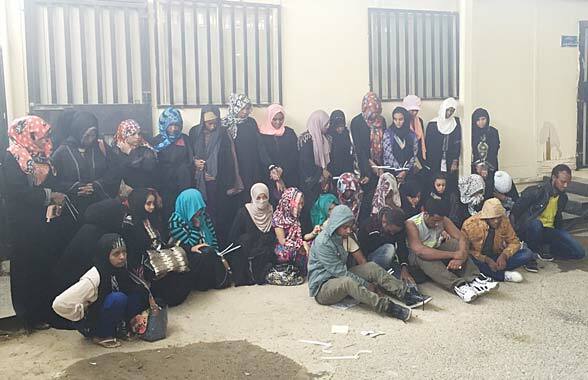 KUWAIT CITY, Nov 24: Officers from the General Residence Affairs Investigation Department arrested 33 Ethiopians – five men and 28 women – for violating the Residency Law. This came after the securitymen received information about some persons providing shelter to female expatriates who were reported absconding by their employers. It was discovered later that these expatriates are working in houses in Jleeb Al- Shuyoukh. After verifying the information, the officers raided the shelter and arrested the Ethiopians. The department advised the domestic workers not to escape from their sponsors and work for other employers to avoid legal problems. It also warned the public against providing shelter to those who violated the Residency Law and others involved in criminal acts.